These transmitters can be called via mobile phone worldwide. According to their configuration you can now capture conversations in rooms, at remote phones or from outside by stethoscope. 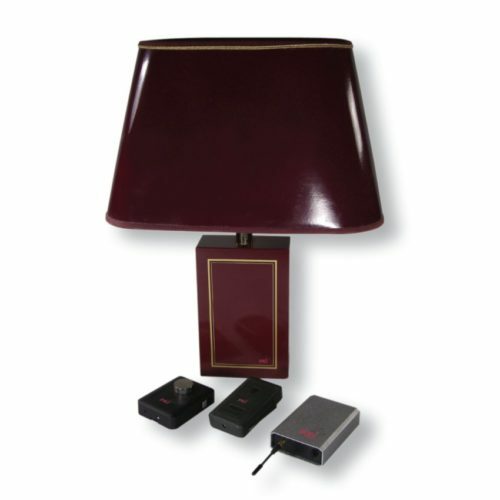 Camouflaged GSM transmitters in a monitoring socket, table lamp etc. are invaluable for such purposes as well. Very comfortable is the power plug as this offers unlimited monitoring possibilities. The installation is easily done. You simply have to insert a customary SIM-card (mobile phone card) and you can call the GSM transmitter in question and listen to the conversation in the room where the GSM transmitter is installed. No noise will be audible when calling the GSM transmitter.